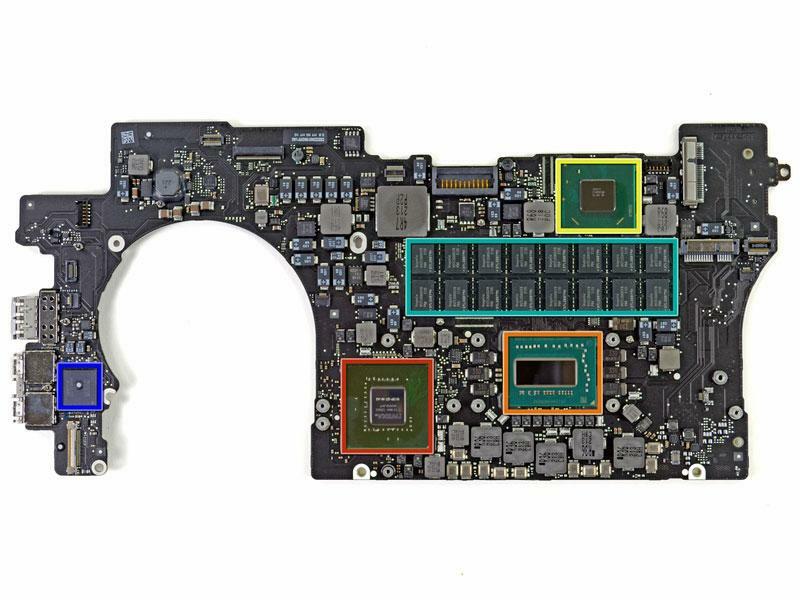 Apple's new Retina display MacBook Pro has been taken apart and examined from the inside, revealing that the RAM is soldered onto the logic board and cannot be upgraded, and that the proprietary solid-state drive memory was supplied by Samsung. 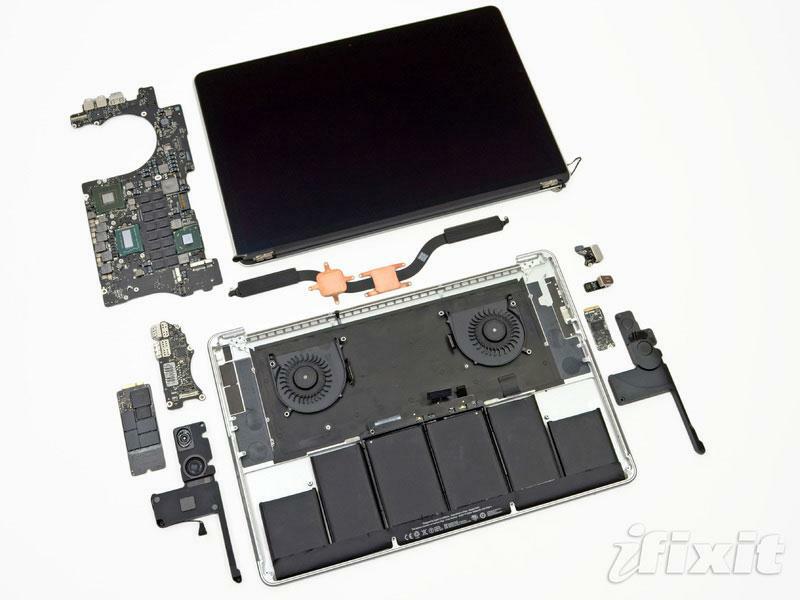 The details come from iFixit's extensive teardown of the next-generation MacBook Pro, which the site published on Wednesday, just two days after the new notebook was announced. The solutions provider took particular issue with the design of the new MacBook Pro with respect to repairability, giving it a lowest possible score of 1 out of 10. "Even though it packs lots of gee-whiz bells and whistles, we were thoroughly disappointed when we ventured inside," they said. "This is, to date, the least repairable laptop we've taken apart. Apple has packed all of the things we hate into one beautiful little package." 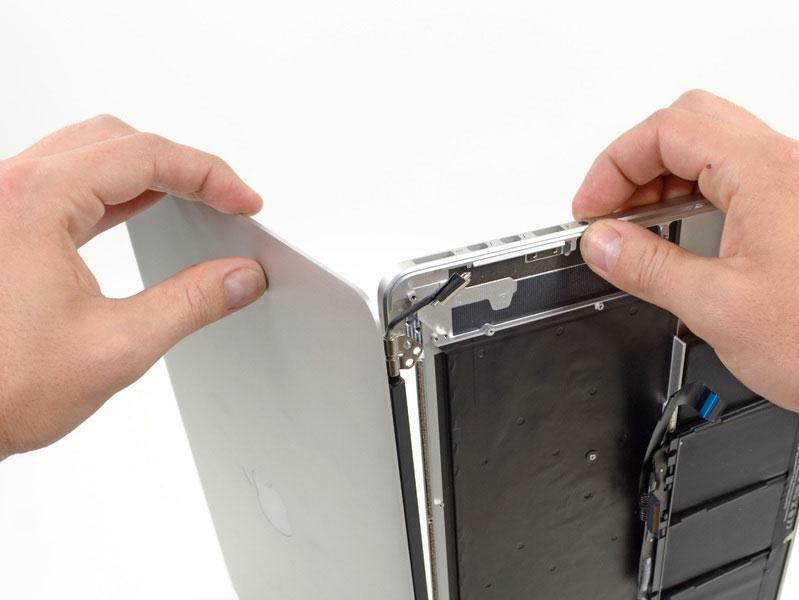 Among the issues iFixit has with the Retina display MacBook Pro is the fact that the battery is no longer screwed into the machine, and has instead been glued into place. This increases the chances that it will break during disassembly, and makes it particularly hard to fix the trackpad, as its cable goes under the battery. In addition, the display assembly is completely fused, and there is no glass protecting it. Any failure with the new Retina display would likely need a full replacement. And the exterior of the MacBook Pro is sealed with proprietary pentalobe screws that will prevent users from cracking it open. 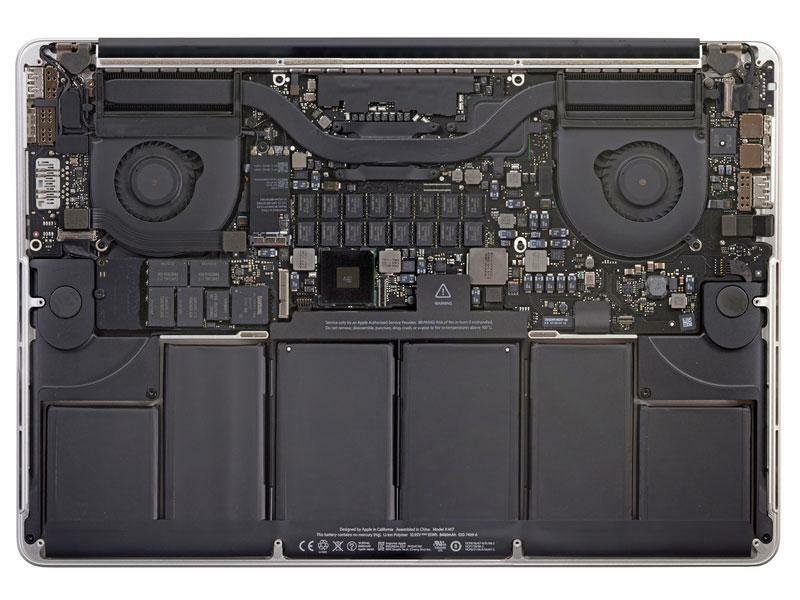 As with the MacBook Air, the RAM on the new MacBook Pro is soldered onto the logic board, which means that it cannot be upgraded after it is purchased. The next-generation MacBook Pro comes with up to 16 gigabytes of RAM. The model disassembled also featured 512 gigabytes of Samsung flash memory. The proprietary solid-state drive found in the new MacBook Pro was called "similar but not identical to the one in the air," featuring a separate daughter card that the site hopes will be upgradeable in the near future. Also discovered inside the new notebook was aBroadcom BCM4331 single-chip 802.11n dual-band wireless and a BCM20702 single-chip Bluetooth 4.0 HCI solution with Bluetooth Low Energy support. An asymmetrical fan found inside the MacBook Pro spreads the noise produced over multiple frequencies, making it less noticeable. But iFixit said attention given to the fan by members of the press is "a testament to Apple's marketing department," more than anything else. The central processor and graphics processor heat sink feature an exhaust air vent assembly that pushes the air through a restriction before it gets to the outermost vents. This additional pressure drop accelerates air and pushes it out of the computer faster.